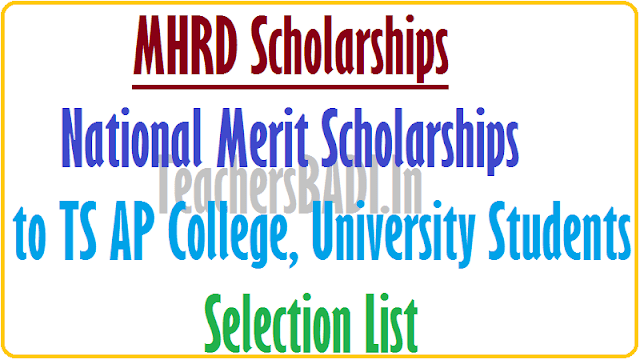 National Scholarships to TS College,University Students, National Scholarships AP College, University Students. 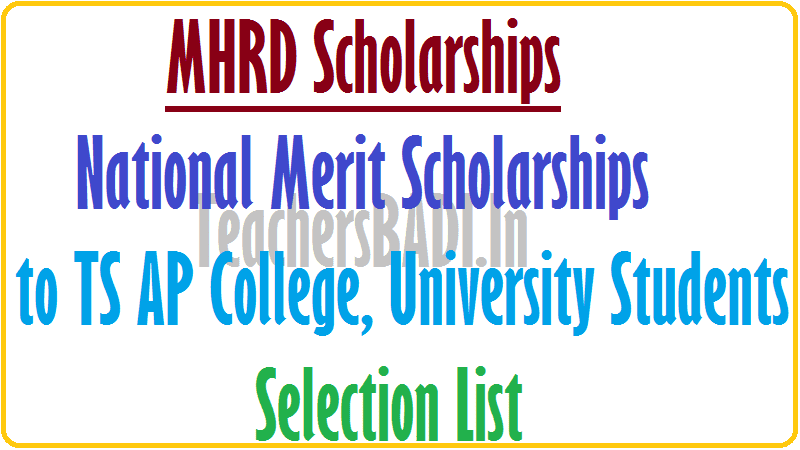 TSBIE MHRD Centre Sector Schemes Scholarship IPE March-2018 Provisional Selection Candidates, List of Provisionally selected candidates for National Merit Scholarship (MHRD). Central Sector Scheme of Scholarship for College and University Students. The Central Human Resources Department has allocated 2,570 scholarships (merit scholarships) to Telangana state. Scholarships are granted to students who have completed intermediate exams. They will be given for five years. The first three years are given at the rate of Rs.10,000 per annum, followed by Rs 20,000 per annum. On the basis of the marks in the inter-examinations conducted in March, the Internal Board has provisionally selected 6,670 students. Only they are eligible to apply for this. The central government would give the 2570 scholarships. The deadline for applying scholarships is October 31. Interested applicants may apply through the National Scholarship Portal. The last late for applying for Merit Scholarship offered by MHRD New Delhi for Fresh applicants is 31-10-2018. The students who passed Intermediate course in march 2018 pursuing higher studies in 2018 -19 can apply through online by visiting the website (http://scholarships.qov.in) The list of provisionally selected candidates will be placed in our website i.e. bie. telangana. gov. in. 1) Last Date for submission of Fresh applications by students for the A.Y. 2018-19: 31-10-2018. 2) Last date for 1st Renewal of 2017-18 batch: 31-10-2018. 3) Last date for 2nd Renewal of 2016-17 batch: 31-10-2018. The MHRD has allotted 2570 Scholarship to the State of Telangana. The provisionally selected candidates who are interested can avail this opportunity. Central Scheme of Scholarship for College and University Students: The National Merit Scholarship Scheme, the objective of which was to provide financial assistance to meritorious students studying from Class XI to Post- Graduation level in Government Schools/Colleges and Universities has been discontinued with effect from 1.4.2007. However, a new Central Sector Scheme of Scholarship for College and University Students has been introduced during XI Five Year Plan. The objective of the scheme is to provide financial assistance to meritorious students from poor families to meet a part of their day-to-day expenses while pursuing higher studies. The scholarships are awarded on the basis of the results of senior secondary examination. 82000 fresh scholarships per annum (41000 for boys and 41000 for girls) for graduate/post-graduate studies in colleges and universities and for professional courses, such as Medical, Engineering, etc. could be provided. The total number of scholarships has been divided amongst the State Boards based on the State’s population in the age group of 18-25 years, after segregating share of Central Board of Secondary Education (CBSE) and Council for the Indian School Certificate Examination (CISCE) on the basis of number of students passing out from various Boards in the country. The number of scholarships allotted to the Boards are to be distributed amongst pass out of the Science, Commerce and Humanities streams of the Boards in the ratio of 3:2:1. Students who are above 80th percentile of successful candidates in the relevant stream for a particular Board of Examination, in class XII of 10+2 pattern or equivalent and having family income of less than Rs.6 lakhs per annum, pursuing regular courses (not correspondence or distance mode) from recognised educational institutions and not availing of any other scholarship scheme, would be eligible for consideration under this Scheme. This is applicable to all categories of students both ‘general’ and ‘reserved’. The rate of scholarship are Rs. 1000/- at Graduation level for the first three years of College and University courses and Rs. 2000/- per month at Post-Graduation level. Students pursuing professional courses would get Rs. 2000/- per month in the 4th and 5th year. The scholarships would be paid for 10 months in an academic year. This is subject to annual renewal on the basis of stringent criteria. The Central Sector Scheme of Scholarship for College and University Students is covered under the Direct Benefit Transfer (DBT). Under the Direct Benefit Transfer (DBT) Programme of the Government of India, scholarships are disbursed directly into the bank accounts of the beneficiaries. For smooth operation of the Direct Benefit Transfer (DBT), the Central Plan Scheme Monitoring System (CPSMS) has been devised. The CPSMS is a Web Based Transaction System, which facilitate as Aadhaar Payment Bridge (APB) and Electronic Clearance Service (ECS) /National Electronic Clearing Service (NECS) /National Electronic Funds Transfer (NEFT) based payments. go to : http://www.dealngain.com for freebies,free recharge apps and man more ! !